Ever since the makers of upcoming dark comedy Mental Hai Kya released the first look of the film in March 2018, fans have been waiting for it with bated breath. Apart from intriguing posters what makes the movie highly awaited is the coming together of two powerhouses of talent Kangana Ranaut and Rajkumar Rao after Queen (2014). 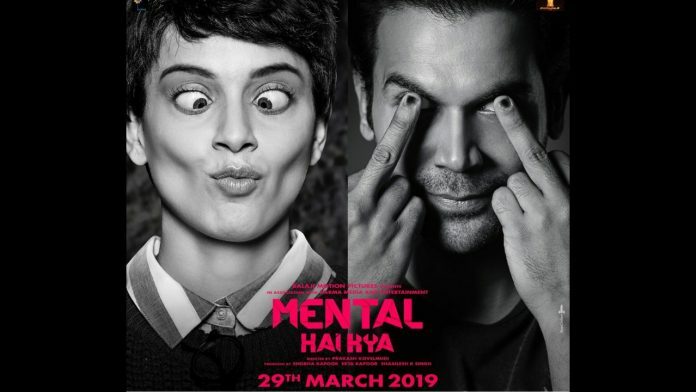 Mental Hai Kya, produced by Ekta Kapoor under the banner of Balaji Motion Pictures, was earlier set to buzz into cinemas on March 29, 2019. But the latest we hear that the makers have now decided to shift the film to May. They are yet to lock a new release date and an official announcement is expected to be made soon. So what has led to this delay? According to reports, it was the film’s female lead Kangana Ranaut who requested the makers to postpone it to May. Reportedly, the National Film Award-winning actress, who was most recently seen in period drama Manikarnika: The Queen Of Jhansi (2019), wanted a breathing space between her two films. Since Manikarnika: The Queen Of Jhansi is still running in several theatres, Kangana does not want her next to compete with her own ambitious project which also marked her directorial debut. Releasing Mental Hai Kya in March would also mean extensive promotional activities for the actress and given that Manikarnika: The Queen Of Jhansi took a toll on her, she wishes to have breathing space between the releases of both her films. Mental Hai Kya is helmed by Prakash Kovelamudi.